Women expose their hair to a long list of factors which can make it weak, dry and brittle and the damage can be quite visible. That’s why it’s really important to give our hair the proper attention and care in order to protect it and make it silkier and smooth. Most importantly to allow it to grow without split ends and breakage.The hair care products which are readily available in almost every store rarely do anything effective to resolve our problems. And the ones that are effective are usually very expensive and not everyone can afford them. But nature has an answer for everything and hair strengthening is something it can definitely help you with. 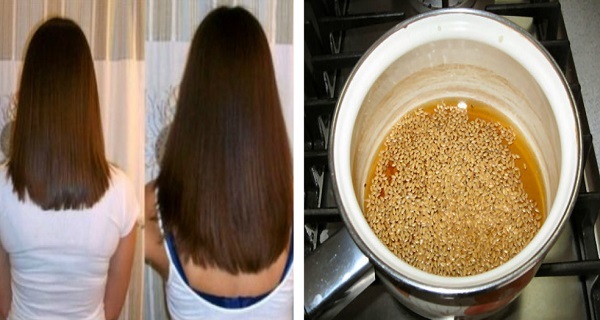 There are a number of natural treatments which can help you strengthen your hair and give it a healthier shine, but one of the simplest recipes out there is flax seed water. You’ve probably read by now that flaxseed and flaxseed oil is very health beneficial and can be used for a number of diseases because it’s a rich source of essential oils and nutrients which we need. When it comes to our hair and its health flaxseed hydrates, regenerates and makes our hair shiny and healthy. And the recipe couldn’t be easier to make. Let’s first see why flaxseed is so good for our hair! Flaxseed is a major source of Omega 3 acids, but it’s also rich in high amounts of vitamins E and B complex, which are essential for proper hair care. Vitamin B complex nourishes the skin and strengthens hair and it’s good for circulatory and nervous system, while vitamin E acts as an antioxidant, reversing the damage and boosting hair regeneration. This flaxseed water recipe can also hydrate your hair, prevent falling out and stimulating hair growth. Another reason why you should start applying this treatment is that it’s perfect for setting your hair and preventing that annoying frizz which can ruin even the best hair day! First you need to bring the water to boil and when it starts you need to add the flaxseed. Leave it until it starts boiling again and wait for a couple of minutes until the water starts thickening. Remove it from the heat and set it aside to cool. After it’s cooled off strain the seeds and add 3 tablespoons of freshly squeezed lemon and mix it all well. Wash your hair as you normally do, with shampoo and conditioner. When you’ve washed it instead of applying any other hair care product take a small amount of the flax seed water and comb it through your hair, from the roots to the tips. Make sure you massage the scalp as well. When your hair dries out you’ll notice it’s shiny, well defined and free of frizz. If you have curly hair you can apply more of the water until you’re satisfied with how your curls look. You can even massage your scalp every night with this mixture before you go to bed for maximum results. You need to know that the shelf life of this natural remedy is 2 weeks max because the only preservative is the lemon juice, so don’t prepare large amounts at once. You need to keep it in a refrigerator and in an airtight container.